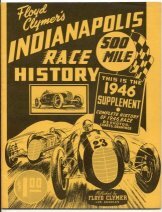 Floyd Clymer began publishing a yearbook about the Indianapolis 500 in 1946 with what is commonly known as the "Race History" book that covered the beginnings of the track in 1909 up through 1941. 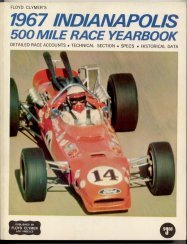 The Race History is 320 pages consisting mostly of reprinted articles and photos from such magazines as “Horseless Age”, “Motor Age” and “The Automobile” plus sections from various years of the race day program. Because the Race History book was published for several years it is fairly common. Soft and hard bound editions were made. 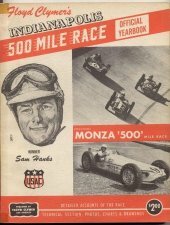 The books for 1946, 47 and 48 are called Supplements and all three are page numbered in sequence to follow from the end of the Race History. There are three cover versions to the 1946 Supplement: no cover, yellow cover and the tougher blue cover. 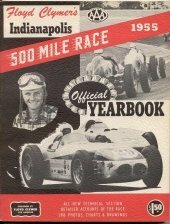 They all contain the same contents except the yellow cover was published after the 1947 race as there is an ad on the inside back cover for the 1947 Supplement. 1946 and 47 supplements are softbound ONLY - Hardbound editions for individual years were available from 1948 through 1966. NO hardbound editions were made for 1946, 47, 67 and 68. 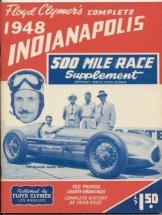 Clymer also produced a "Speedway Driver History" soft bound book in 1948 which is a complete listing of all drivers that competed in the Indianapolis 500 through 1947. 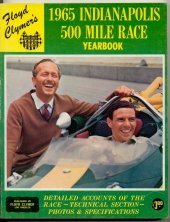 In 1949, Clymer replaces the "Supplement" with the "Yearbook" and it remained so through 1968. The key dates for collecting soft bound Clymer yearbooks are: 1952, 58, 60 and 1967. There are several stories as to why these four years are tough. For 1952, is that it was a short publication run as was the case with 1960. Many were supposedly water damaged in 1958 from a flood or putting out a fire. 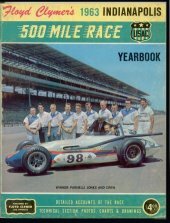 For 1967, past NI500CC President Randy Christensen said he did not receive his 1967 yearbook until April of 1968. They normally came out around mid-September so it was a full 7 months behind, therefore also a short publication run. 1956 and 1961 are moving up the tough list followed by: 53, 50, 51, 54, 55 & 63 - followed by 1947, 64, 65 & 66 and finally 1948, 49, 57, 59, 62 & 68. Softbound issues had medium grade covers to them up until 1963 when they went to a bit heavier grade slick type cover. 1952 & 53, especially '52's, are known to have spine crack problems. Note the crack around the "D" of "FLOYD" in the picture below. 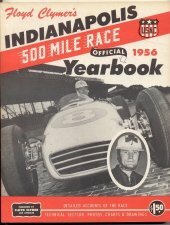 1963 has a similar problem due to it being the thickest yearbook besides the Race History. Soft bound editions had a picture of the winner or the start on the cover. 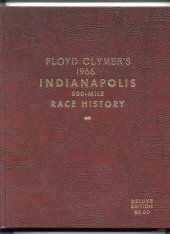 Race History hard bound editions are titled on the front cover “Indianapolis 500 Mile Race History” and the 1948 through 1966 hardbound editions are titled “Floyd Clymer's (year) Indianapolis 500-Mile Race History”. The majority of hardbound editions are maroon in color with the exception of some Race History editions and the 1949 edition which are brown*. Hardbound editions generally hold up well, but beware of the yearbook inside coming loose or detached from the covers. 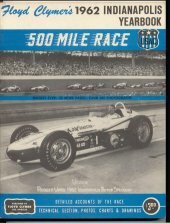 The Race History book does come with a dust jacket which is identical to the softbound cover and it's a tough one to find. In 1959, the title was added to the spine of the book which is the same coloration as the printing on the cover. The printing on the front changed to gold in 1962 and the spine reflected that change as well. 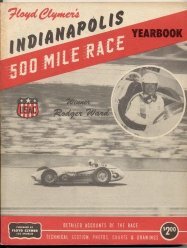 Hardbound Clymers are tough to find in general with the 1952, 54, 55, 56, 58, 60, 63 and race history with dust jacket being the toughest to get. Then 1949, 50, 51, 53 and 61. 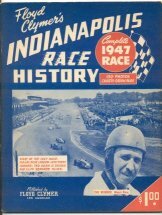 Next are the remaining books of 1948, 57, 59, 62, 64, 65, 66 and race history with out dust jacket. The Hardbound Race History Yearbooks with and with out dust jackets.